A botnet named after Chuck Norris has been using roundhouse kicks and password guessing to take control of your router, and steal your girlfriend. Researchers in the Czech Republic have discovered a piece of malware that has been taking control of routers with the Linux operating system. Masaryk University's Institute of Computer Science in Brno, Czech Republic, dubbed the malware and its botnet after the American martial artist because of a line of code in it which reads, "in nome di Chuck Norris." In Italian, that means "In the name of Chuck Norris." The malware is able to install itself on routers by guessing the admin passwords of D-Link brand modems and then using the remote access "feature" to redirect your internet traffic to malicious websites. We all know that Chuck Norris CAN believe it's not butter, and that when he does a push up, he's actually pushing the Earth down. But he's also apparently a hacker who can take control of your router by reading your mind, especially if you never changed the password on your router from the default. My theory is that Chuck Norris got bored with beating up people in real life, and that he stared at a computer long enough to copy himself into the Internet. Along the way, he beat up The Lawnmower Man and Tron's MCP, two virtual entities who had eluded his fists for years, before turning his attention to your router. 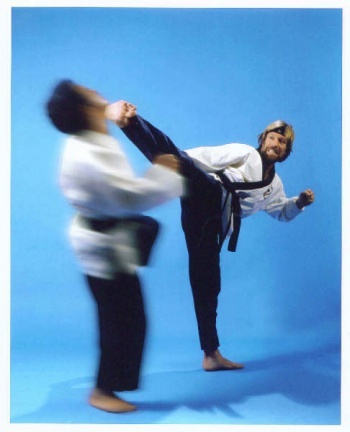 Jan Vykopal, the head of the network security department with Masaryk University, said that even though Chuck Norris is nigh impossible to defeat in hand-to-hand combat, you can at least delay his attacks on your router by making sure your passwords are strong. And please, change it from "admin." Once Chuck Norris is installed though, the only way he can be killed is by placing three drops of Chuck Norris' tears on your router. Either that, or you can restart it, erasing Chuck from the device's RAM.